Layout tabs have been in AutoCAD since version 2000 and make the whole 'Paper Space' concept in AutoCAD a lot easier to understand. Tabs provide an intuitive environment to preview printer settings, margins and printable extents. Occasionally however they can disappear, or be turned off by a 'helpful' colleague. This will result in a blank section near your command line. However there will still be a button to switch between Model and Paper space if required. Generally though it is preferred to use the layout tabs, to do this it is necessary to go into the 'options' dialogue box. 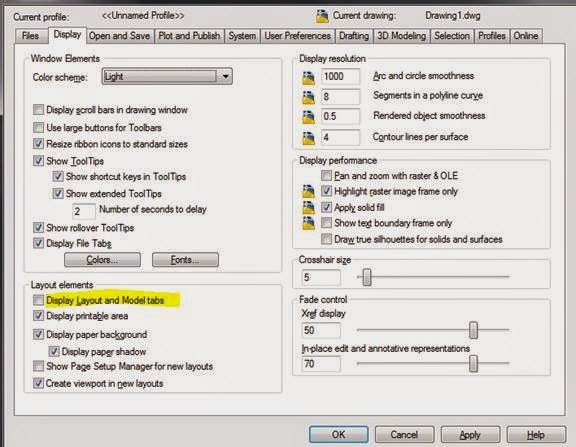 Choose the 'Display' tab and tick the indicated section illustrated below. This should be saved to your local registry profile and remain set for current and future AutoCAD sessions.